Mastri Birai Umbri is owned by the Farchioni family, which has become a powerhouse in basic agricultural products since the late 18th century. Farchioni olive oil is ubiquitous, and their flour only slightly less so, and while the quality of these products is high, they’re not the sorts of commodities I associate with a craft brewery. But I am starting to rethink the casual opposition between “industrial” and “craft” or “artisanal”. It’s true that industrial food processes are often soulless, repetitive and designed to serve only the bottom line, degrading the notion of quality about as far as it will go before people revolt. But my conversation with Michele showed me that it is possible to take an industrial approach to the production of a high-quality product. He insists on repeatability – that the brew should taste the same each batch and present the drinker with the same experience each time. That is probably the major distinction from a more artisanal or craft approach that instead of stomping out all the differences uses a different kind of skill to allow the product to vary slightly from batch to batch. The quality of Michele’s beer, however, is unimpeachable. The other big distinction, I suppose, is quantity. When I asked him what the future might hold for craft beers in Italy, Michele thought it unlikely that 500 breweries could survive, because many are too small to compete. But why should that matter? If you’re big enough to survive at some scale, perhaps only in a local market, do you have to keep growing. This is one of those eternal business mysteries that I’ve seldom heard explained to my satisfaction. Why is perpetual growth necessary? Of course, demand may increase. But if you’re making as much as you want to and need to, and don’t want to regulate demand by increasing the price, that’s an opportunity for someone else to enter the market. You don’t have to do it yourself. All of which is probably a bit deep for a consideration of well-made beers. In any case, I think I need to stop using “industrial” as a term of opprobrium and focus instead on the product, rather than the means of production. No link to the Farchioni website, because it autoplays noise, and I hate that. The whole pure yeast vs wild fermentation debate is fascinating. 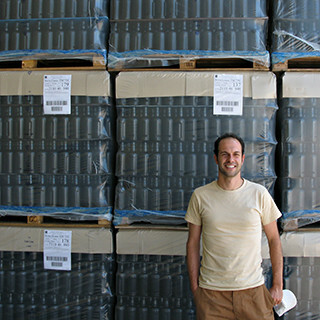 Here’s a recent account from Australia: Winemakers turn to wild fermentation. As an expert on olive oil and a professional taster, I fully agree with the feeling of appreciation and the approval of the industrialization of the final process of obtention of a product as something positive. In the case of virgin olive oil, the modern technology and the industrialization of the whole process guarantees the extra quality so much better than the most reliable of the artisanal procedures, no doubt. That’s a very interesting observation, Alicia. Thanks. It seems that investment in advanced engineering can indeed improve several aspects of food production. Probably the crucial point, as Michele said in the interview, is how quickly you try to recoup the investment in that machinery. What matters is not how little beer you make, but how carefully you make your beer.